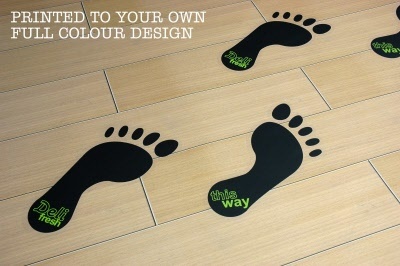 Top Selling Footprint Floor Sticker. These Graphics are Ideal for advertising your products and directing foot traffic in a creative style. Product cut and printed to standard footprint shape. Customise your graphic with your own text or logo at no extra cost. If you select that you wish to add your own logo to this design please email your logo to sales@customark.co.uk once your order has been placed, quoting your order number. If you select "Other" as your footprint colour please confirm the shade you require in the message to us field when placing your order at secure checkout.